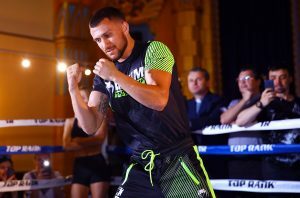 WBA/WBO lightweight world champion Vasiliy Lomachenko felt right at home Tuesday at the Ukrainian Culture Center, site of Tuesday’s media workout. Lomachenko (12-1, 9 KOs) won a pair of Olympic gold medals (2008 and 2012) for his native Ukraine. Lomachenko will defend his world titles against the hard-charging Anthony Crolla (34-6-3, 13 KOs), while longtime WBO super middleweight champion Gilberto “Zurdo” Ramirez (39-0, 25 KOs) will dip his toe in the light heavyweight waters versus veteran Tommy Karpency (29-6-1, 18 KOs) in the 10-round co-feature. The undercard broadcast (ESPN+, 8 p.m. EST) will feature unbeaten 140-pound contender Arnold Barboza Jr. (20-0, 7 KOs) against former world champion Mike Alvarado (40-4, 28 KOs) in a 10-rounder and welterweight contender Alexander Besputin (12-0, 9 KOs) versus Alfredo Blanco (20-7, 11 KOs) in a 10-rounder for Besputin’s USBA belt. Besputin is ranked No. 1 in the world by the WBA. Three days before taking center stage at STAPLES Center, this is what the fighters had to say.